Tracking your work and what you do may sound a little simple (however, we’ve proven before that it’s not necessarily the case). But just imagine having lots of people working on the same project (or more than one project) at the same time. That’s when it actually becomes not so easy to track what’s going on. Online collaboration tools are on the rise with businesses who want to track their employee’s workflow – especially remotely. You might have already seen our previous article comparing Asana and Trello, but instead of comparing the user experience we will look at the features and usability of each app. In my personal experience, working with others remotely and trying to track what they’re doing whilst keeping organized (and not going insane) seems impossible, but actually it can be quite easy as soon as you find the right tool. I have briefly used Asana and Trello before, and they both have pros and cons, so picking a favorite is difficult. So, without further introduction, let’s get straight to the point and find out which of these apps is better for collaborating with your team. And while this post looks at the two apps from a subjective opinion I will tell you more about each app so you can decide what works for your team. Asana is one of the most popular task management apps available today. This simple tool was first created by former Facebook execs Dustin Moskovitz and Justin Rosenstein in 2008 to manage the company’s internal coordination. It was then publicly released in 2011 and has become increasingly more popular. “Think back to the last time you were deep in the zone—time flew by and the work flowed through you almost effortlessly. That’s how working together should be. Asana is basic and plain in its approach towards task/project management. 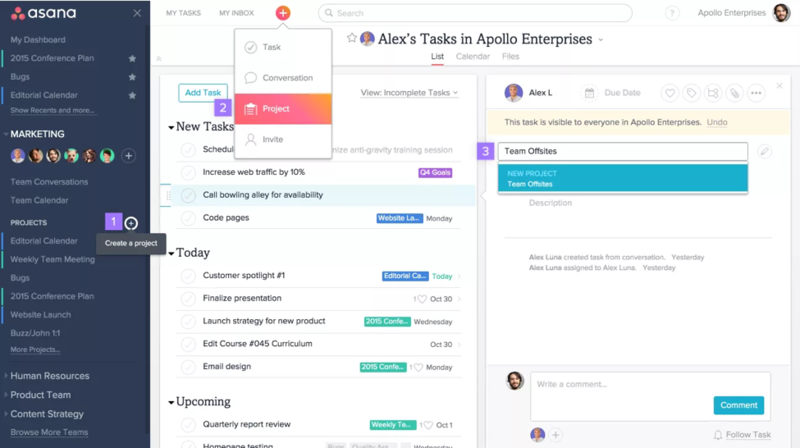 At the core of it, Asana is a task management platform that can also replace all of today’s modern communication (and replace email, for example). The good thing about Asana is that there is nothing complicated about it — some of the features are listed below. Tasks. Tasks are things you need to remember or things that you want to have completed. 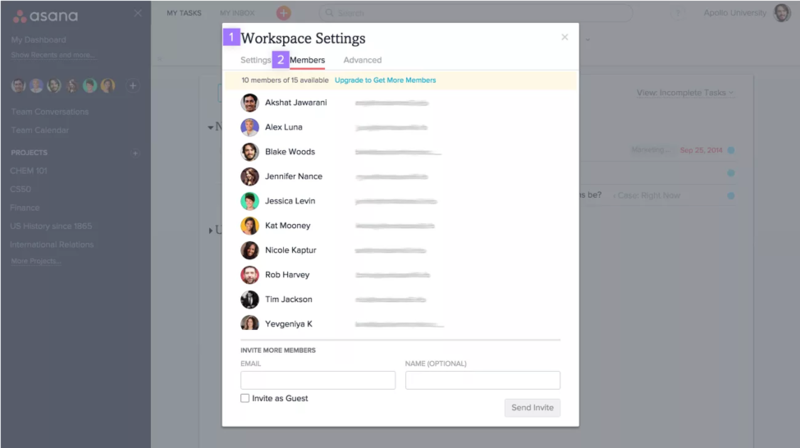 Asana’s simple UI lets you organize Tasks into three groups: Today, Upcoming and Later. Organizations, Teams and Workspaces. These are the core divisions inside Asana. Workspaces are for people who sign-up with their own personal email address (think: students and friends). Organizations, on the other hand, are created for people who sign-up with a uniform company email. Each Organization is then broken down into separate Teams. Sections. Used to group single tasks into a project. Getting creative, you can divide tasks up in various ways. Some of the most popular are bug tracking and status reports. But you could easily divide tasks up by project, purpose or theme. The more divided tasks are, the better it is for larger teams looking to get an overview of their tasks. Templates. Asana allows you to use existing templates or you can create brand new ones more fitted to your needs. You can create templates such as checklists or questionnaires to avoid that “talking to your colleagues about stuff” step in the process. You want to know what’s the status on Mary’s project? Just send her a questionnaire with exact questions and never hear about her cat ever again. The features of Asana are geared towards ease of use. When I returned to it for the first time recently, I didn’t feel overwhelmed by the UI — I honestly felt like I knew my way around the app within 5-10 minutes. Being picky by nature, I would say the minimalistic UI makes it tricky to work with. But on the plus side there are a whole load of pros, too. So, I’ll use a good old-fashioned bullet-list of pros and cons and let you decide for yourself. Asana’s benefits would more likely be acknowledged by bigger teams or when working on a more complex project. For example, a website design where you’re going to have more people collaborating on it and pitching their ideas. In situations like these, there is a higher chance to get disorganized and cluttered, but Asana can cope with it (better than Trello). Through Zapier you can integrate Asana with more than 500 apps. 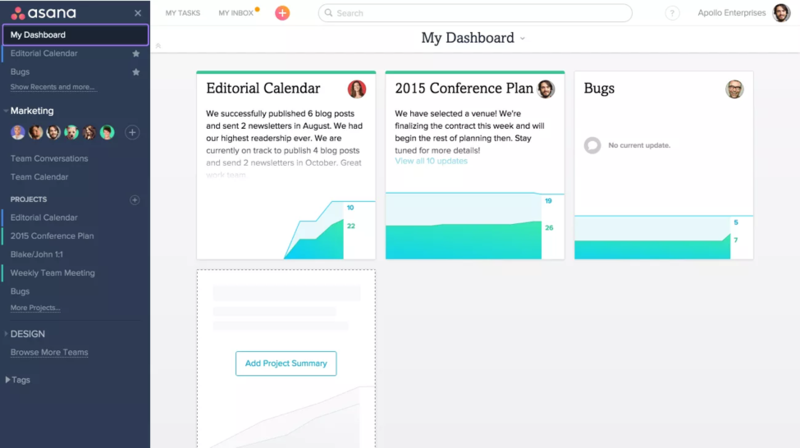 Asana has an open API that you can use if you’re a tech-savvy person. Like with Asana, I’ll start by introducing you to the app first. 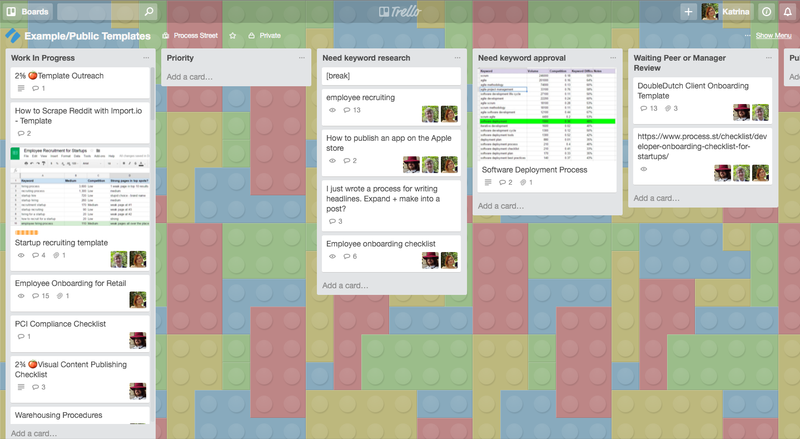 Trello is a task management app that uses the Kanban system to help you organize projects. Kanban is a system developed by Toyota – designed to help keep production levels high and literally means a billboard or a signboard. And as we know Trello is famously known as a sticky-note filled whiteboard. Each and every sticky note represents different tasks that are within the project, your daily task list or ongoing tasks. When speaking of collaborations, I must admit that so far I have only the best things to say for this app – from 12 different spreadsheets we’ve gone to Process Street templates and 1 Trello board (used to be 5 but that’s a story for another time). This app exceeded my expectations and works way better than Asana for the tasks we’re trying to accomplish. “Trello is the free, flexible, and visual way to organize anything with anyone”. Board. A Board is usually a project under development or an ongoing process such as content creation or promotion. List. A list is a way to divide a board into different categories. Usually, a list represents a stage of progress. In this case, you can see the stages are work in progress, keyword research, moving to approval (which kind of helps with the assigning as you can just move a task to the relevant list). Card. Cards are the most basic part of the app – and the most crucial. It represents a particular part of a project like a bug, new feature or a specific blog post. You can attach files, images, comment, add checklists, assign a due date or people to each card.. And of course you get the satisfaction of moving the card further and further through the project until the glorious day you can remove yourself from it indicating a job well done! Now to the comprehensive list of pros and cons. As you can see I had to force myself with the cons a bit. It might be my biassed opinion, but I find Trello to be extremely useful in my day to day tasks. It is incredibly effective as a to-do list app with its sticky note feel, it provides the sense of progression and is just as good for personal lists and team projects. Trello has a premium plan that is priced at $8.33 – the same as Asana. However, in total there are 500+ that you can use through Zapier. 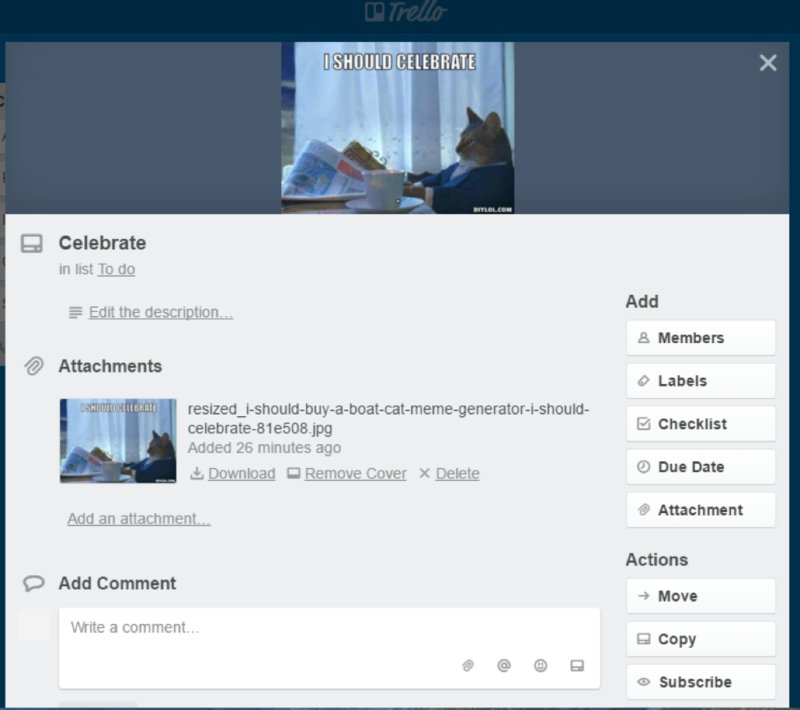 You can also use the Trello API to create your own integrations (which is always lots of fun!). Asana and Trello are pretty close in the match-up, but in the end, Trello has won me over. I work on a few projects at the same time and feel like Trello just does it for me – I make each project into a board, make it a different color, add different people and roll on my way. What about you? Which seems like a better app to your team’s needs, and why? Source: Trello vs Asana: The Best Project Management App?